The violet La Sportiva shoes represent an unconditional point of reference in the history of climbing. Not only sport climbing. There is a ‘before’ and ‘after’ the Mariacher, in the sense of climbing shoes. Whoever has crossed over, or better still climbed, the rocks during the early 80s will bear witness as to how those yellow and purple shoes, created by La Sportiva and fine-tuned by Heinz Mariacher, marked a paradigm shift. Or better, a change in era. They marked the definitive and absolute supremacy of climbing shoes over boots, and also the affirmation of new climbing. The climbing that threw itself into exploring that immense sea of rock and difficulties which had not yet been tackled. It might seem like a pretentious vision, but it isn't if you consider that those were truly revolutionary years. Those years were represented by youngsters who were in their twenties and who were looking for new roads and new routes, even on rock. It’s not as if that kind of climbing and those climbing shoes came from nowhere. We need to go back to see that 30s, there were people climbing the big Dolomite rock faces with shoes with felt or rope soles. We are talking about Angelo Dibona, Luigi Rizzi and Emilio Comici, and those climbers who wrote the history of the 6th grade. Then the boot with a rubber Vibram sole was invented, and this brought its undeniable advantages: that special rubber never wore out or split open like the first shoes. On the other hand, innovation deeply changed the technique and way of climbing. With those heavy and rigid boots, the climbing was mainly tackled ‘on the tips of the boots» with measured and static movements, always frontally and detached from the rock. This had nothing to do with the dynamic and varied climbing style the ‘6th grade acrobats’ resorted to. So much so that between the 50s and 60s, the majority of climbing was aid and the routes climbed were the classic direttissime; they followed the path a drop of water would take down the mountain. Not that there was a lack of outstanding climbers, just think of Cesare Maestri and Raffaele Carlesso, butin those days there was a different focus and free climbing was not at all a priority. Even the concept of free climbing, at the time, was different. You'll have to wait till the end of the 70s, in fact you'll have to wait for a new generation of climbers before free climbing makes its mark and new horizons are opened up for exploration. Maybe everything started with the most classic impetus: progress. Those young climbers wanted to be better than those who had gone before them. Probably nothing would have happened if a new wind had not blown through those years to change things and cause everything to be observed from a new perspective. That desire to go beyond the usual parameters permeated everything and naturally climbing was not immune. So, everything was called into question. The freedom to explore translated into the desire to climb free, to overcome those limits that seemed enshrined in divine law. The desire was to go beyond the peak and beyond conquering summits, instead it would have focused on one’s movements and the beauty of the climb. Climbing thus became a large lab of gestures and ideas which involved everybody. Everyone tried to put something personal into it, since everything had to be different, and everything changed. From how you were dressed to what you wore on your feet to climb. This involved the clothes you wore and the shoese you chose to climb with. The first dungarees were bought at the local market, jeans were used instead of the classic knee-length climbing breeches and then tights were stolen from girlfriends. While the stiff boots of their fathers started to disappear, a type of footwear, much more like what their 6th grade grandfathers wore, started to reappear. They were called EB, the sole was made of smooth rubber and instead of being made from felt, they looked more like basketball shoes; in those years, up to the 70s, it wasn’t at all easy to find them in Italy. Probably that is why more than one climber experimented by using gym shoes - high top Superga basketball shoes - on the crags and before that on the rock walls of the Dolomites. Not to mention the stories repeated by word of mouth like the one from Veneto about Tepa Sport shoes, which were completely anonymous gym shoes on sale at the markets which claimed to have a fabulous grip. Of course, it wasn’t true. In fact, the search for the perfect climbing shoe had already begun at an equal pace and in line with the climbing which and overcame them day by day, was venturing into new limits. And so, the first prototypes of the new climbing shoes appeared, studied and advertised by almost all the prophets of new climbing era. The sole was of great importance, or rather the compound with the magic grip to get over the slabs and vertical walls, which nobody had ever climbed before. Here, too, word spread amongst climbers about a new super rubber. Amongst these, the best known was Aerlite, normally used as soles for clogs. The problem was that the very soft rubber wore out far too soon: they say that some just needed to climb a long route in the Dolomites to wear it out completely. Then, finally, the La Sportiva Mariacher shoes appeared: it was 1982 and the starting point and the reference point that everyone was looking for. If ideally the new climbing style was also the freedom to explore new movements, those shoes represented the tools to do so. It was the beginning of a path leading towards an evolution which up to then had only been dreamt of and still had to come into focus. To guarantee the maximum performance of shoes in those days and keep their shape over time, climbers wore shoes which were three or four sizes too small. The result was unbearably painful feet and at the same time the proliferation of empirical methods to adapt them quickly such as putting their feet into a basin of hot water, obviously with their shoes on. As well as using the trick of plastic bags to help feet slip into the tight shoes more easily. That was only the beginning of that kind of climbing, which in the meantime, as well as being free, would then become sport climbing first of all and then even competition. In the meantime, the repertoire of climbing moves evolved further. 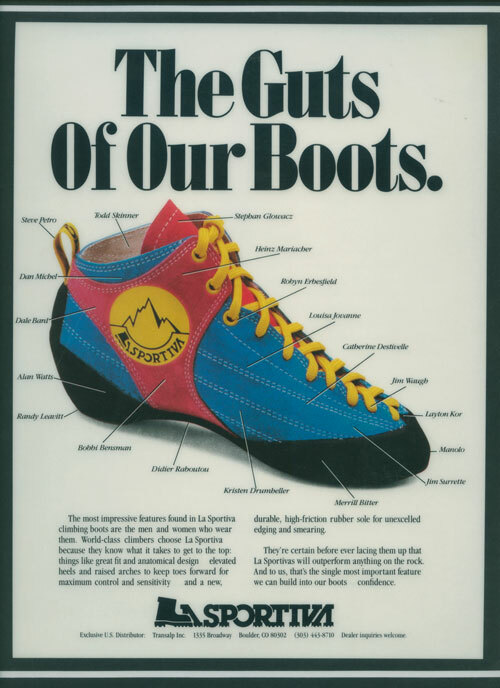 And that is how in 1984, even at La Sportiva, the first slipper shoes were born. This was an intuition, a starting point, as well. The idea of freedom, present within the concept of free climbing, had been opened up. In the meantime even the Mega shoes had reached shops in 1986: these were the shoes of the first Rock Master champions, studied specifically for great performances in competitions. This confirmed the notion that there was not one single model which was ideal for all types of rock and all styles of climbing, but that climbing shoes had to adapt to climbers and to an idea of climbing which was branching out. Ever since those days, the art of climbing rock has continued along its path, on rock faces, on boulders and in artificial rock gyms all over the world and climbing shoes have continued to mark the rhythm along this path. Now we all know that for every foot type of climbing style, rock on artificial wall, there is one climbing shoe which is better suited than another. There are climbing shoes made specifically for women and for youngsters, for climbing overhangs and for climbing on slabs or granite cracks. Climbing in indoor gyms seems to have opened up a series of never ending possibilities. 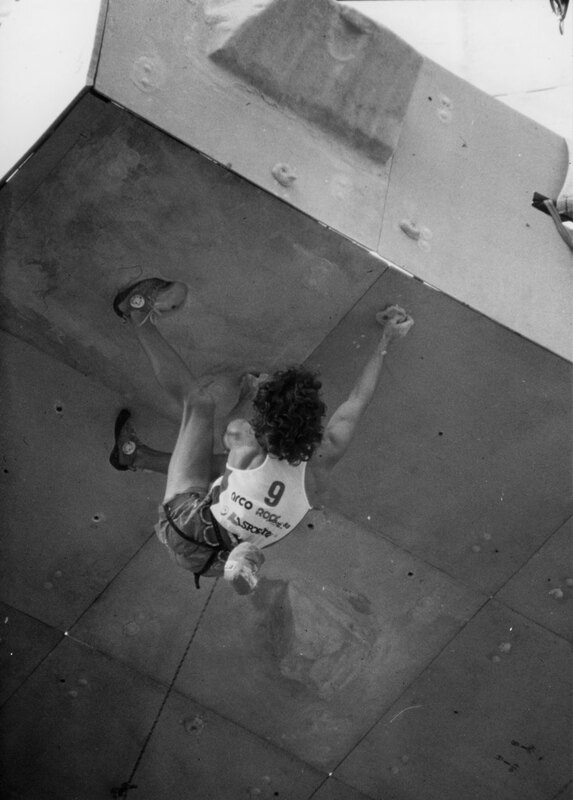 In 2020 climbing competitions will be at the Olympics for the first time ever. And so, the road goes on and it is time to think of free climbing as constantly being different and increasingly modern. Obviously, while wearing the best shoes ever.